Control your tasks and projects in one place. Boost Productivity. Get things done. MasterList Professional gives you a powerful tool for making the most of your time, managing your professional and personal projects and improving your personal productivity. MasterList Professional allows you to track your tasks and projects for work, home, and even ideas that you have and keep them integrated thus bringing a BETTER work life balance. With MasterList Professional, you start your day from the Home Tab (screen shot below), where you can see the health and activity of all your projects at a glance, your current tasks and key statistics on where your time and effort is going. 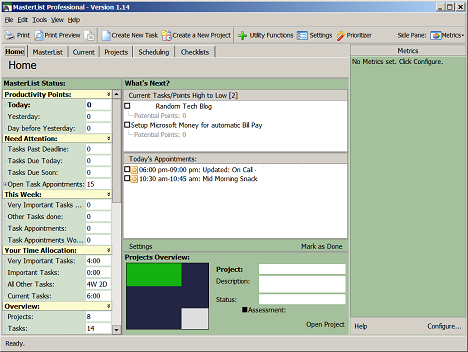 A host of features - Automatic Task Appointments, Keywords, a System Tray quick-access menu, the Prioritizer tool, integration with Microsoft Outlook (through 2007) Appointments and Tasks - assist you in getting things done and using your time well. Unlike "to-do" list applications, MasterList Professional improves the quality of what you get done; unlike project management software, MLP is fast and easy to use.